We’ve got full details of the Honda City Hybrid, or more accurately its Japanese-market twin, the Honda Grace, now that the latter has gone on sale in Japan today. The handsome B-segment sedan gets the petrol-electric drivetrain from the Jazz Hybrid and promises class-leading fuel economy. The Grace is near-identical to our 2014 Honda City, but with a few subtle differences. Outside, there’s new blue-tinged chrome trim on the grille, LED tail lights and a small bootlid spoiler. As standard, the Grace gets the Jazz Hybrid’s 15-inch steel wheels with hubcaps, while the alloy wheels that we get here are reserved for the top-spec EX – 16-inch for two-wheel drive models, 15-inch for 4WD. The cabin receives a new instrument cluster taken from the Jazz Hybrid, with two colour displays flanking the centre speedometer. The smaller gearlever is also taken from its hatchback sibling, while the steering wheel is adjustable for reach as well as rake. For the first time, Honda has revealed the powertrain that drives the Grace, and it’s the same Sport Hybrid i-DCD (Intelligent Dual Clutch Drive) system as on the Jazz Hybrid, with a 110 PS/134 Nm 1.5 litre i-VTEC Atkinson cycle engine, a 29.5 PS/160 Nm electric motor and a seven-speed dual-clutch transmission. 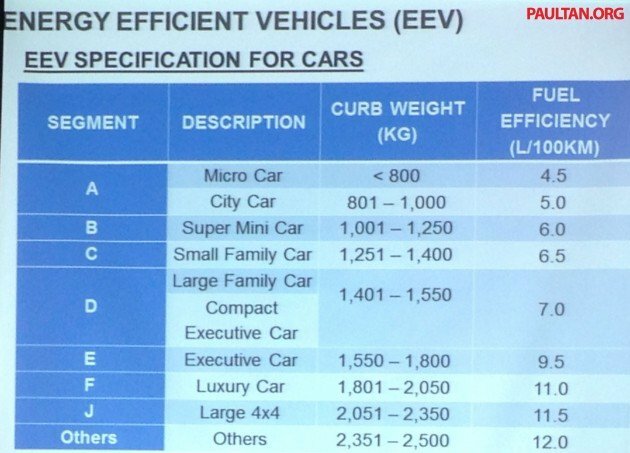 Fuel economy figures on Japan’s JC08 driving cycle are rated at 34.4 km per litre on two-wheel drive models and 29.4 km per litre on cars equipped with four-wheel drive. 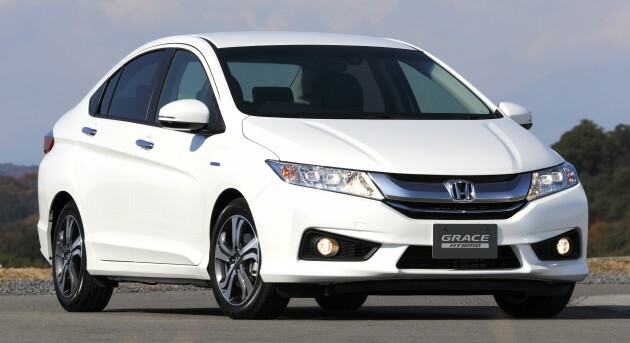 While slightly down on the Jazz Hybrid’s numbers, Honda still claims that the Grace is the most fuel-efficient hybrid sedan on sale in Japan. Standard equipment on the DX includes Vehicle Stability Assist (VSA), keyless entry, push-button start and auto air-conditioning. Stepping up to the mid-range LX nets you twin projector LED headlights, cruise control, a built-in air purifier and heated seats, while the EX gets a safety package with an active city braking system and six airbags, as well as an eight-speaker sound system. Prices start at 1,950,000 yen (RM56,200) for the base two-wheel drive DX model, rising up to 2,409,800 yen (RM69,700) for the top-of-the-range all-wheel drive EX. 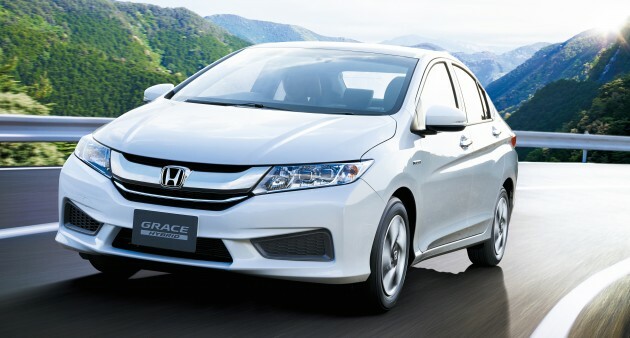 Honda expects to sell 3,000 units of the Grace a month in Japan. 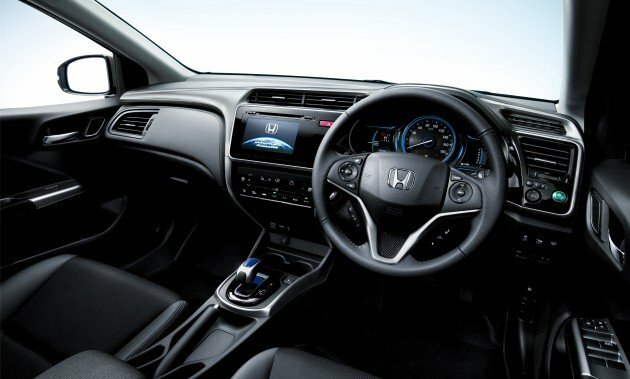 In Malaysia, the Honda City Hybrid was supposed to be launched by the end of the year, but amid problems with the ECU and the dual-clutch transmission on the Sport Hybrid i-DCD system – which has been subjected to multiple recalls this year – we’re expecting its introduction to be pushed back to 2015. For more photos of the Honda Grace, click here. 78 comments | Leave a comment? Little has been revealed regarding what’s under the hood, other than that it’s a Sport Hybrid i-DCD (Intelligent Dual Clutch Drive) unit. It’s more than likely that it will be the same package offered on the Jazz Hybrid and Vezel/HR-V Hybrid models – a 110 PS/134 Nm 1.5 litre i-VTEC Atkinson-cycle engine and a 29.5 PS/160 Nm electric motor built into a seven-speed twin-clutch transmission. Cooling vents for the lithium-ion battery can be seen by the rear seats, just like on the Civic Hybrid. Enough waiting, Driven Web Series is back with a new season, powered by the new Petronas Primax95 with Advanced Energy Formula! Just like last season, we’re kicking things off with everyday cars. The ever-popular Toyota Vios came out tops in our mixed pairing last year, so now we’re pitting it against its closest class rivals, the 2014 Honda City and Nissan Almera – all in top-spec TRD Sportivo, V and VL guises respectively. Looks, performance, handling, comfort and safety – everything considered, which is the best B-segment sedan on sale in Malaysia? Watch the video above to find out the Driven Web Series verdict. As usual, we hold no punches. Thanks for watching, and be sure to head over to CarBase.my to compare the full specifications of the three cars here. It’s sure good to be back, and we hope you enjoy the show! 144 comments | Leave a comment? Still very much the it car of the moment, the 2014 Honda City has impressed us and at least 10,000 Malaysian buyers so soon after its local launch. The Vios-beater is already available with a Modulo-branded bodykit here, but if that doesn’t catch your fancy, maybe Mugen’s upcoming look-faster dress-up package would. The Honda City Mugen Prototype you see here premiered in the Philippines, alongside the standard car’s local introduction there. The Mugen bits include a unique front grille, complete four-piece all-around bodykit, carbon-fibre wing mirror covers, a boot lid spoiler and a set of 17-inch aluminium wheels. 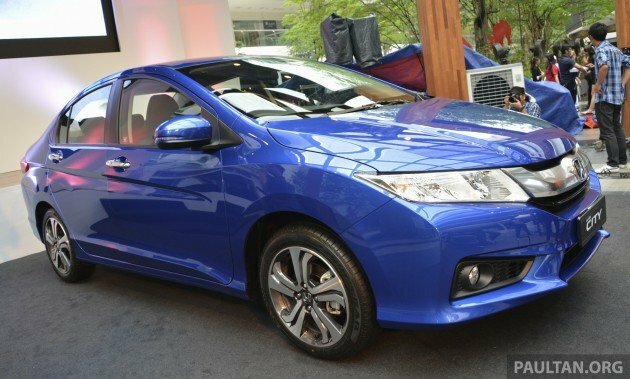 For now, the Mugen package is labelled as a prototype as it’s not quite ready for production just yet, but Honda Philippines says that it will be available for purchase in the third quarter of 2014. Time will tell if or when it will arrive here in Malaysia, where only the Civic is offered with Mugen parts. The question is, will there be any takers? The 2014 Honda City has collected 10,000 bookings within a month of its official launch on March 20, well surpassing the previous record of 3,000 bookings within a month of launch for the fourth-gen CR-V.
Honda Malaysia says it will be able to complete deliveries for all 10,000 bookings by end-June, thanks to the new No. 2 Line in Pegoh, which has doubled production capacity as well as enabled flexible production scheduling to speed up output. In addition, sales are up 30% in Q1 2014 over the same period last year. Honda Malaysia aims to sell 76,000 Honda vehicles this year. Revisit our tireless coverage of the 2014 Honda City here: Launch, test drive, old car, new car, grade-by-grade comparison, walk-around video. 160 comments | Leave a comment? 90 comments | Leave a comment? 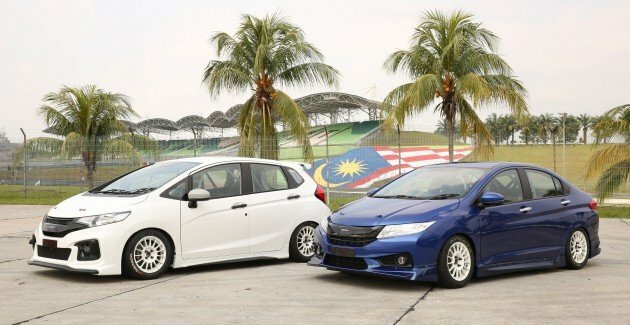 If you think we’ve covered all possible angles of the 2014 Honda City by now, well, you thought wrong, as here comes our spec-by-spec comparison of the four available grades in Malaysia. The new City’s prices vary from RM75,800 for the base S to the range-topping V’s RM90,800, and the like-for-like pictures below show you all their differences. Obviously, all the fancy features (platinum grille, 16-inch wheels, touch-sensitive multimedia head unit and automatic air-con controls, six airbags) are exclusive to the most expensive Grade V, while the entry-level variant appears rather basic in comparison (silver-painted grille, 15-inch steel wheels with covers, single-DIN head unit, manual air-con, dual airbags). Meanwhile, the S and S+ models are also marked out by their conventional front fender indicators and body-coloured door handles, next to the E and V’s wing mirror-mounted LED repeaters and chrome grips. Beyond the obvious are smaller spec changes too, such as the traditional antenna on the S, as opposed to the stylish shark fin-like item on the others. A Grade V example fitted with the optional Modulo and Premium packages are pictured below too. You can refer to the official spec sheet for a more detailed list of the equipment spread. With such big differences in prices though, it’s fair to say that you get what you pay for with Honda’s new Toyota Vios rival. Or should we say Vios-beater? Find out in our initial drive report of the new City. 179 comments | Leave a comment? 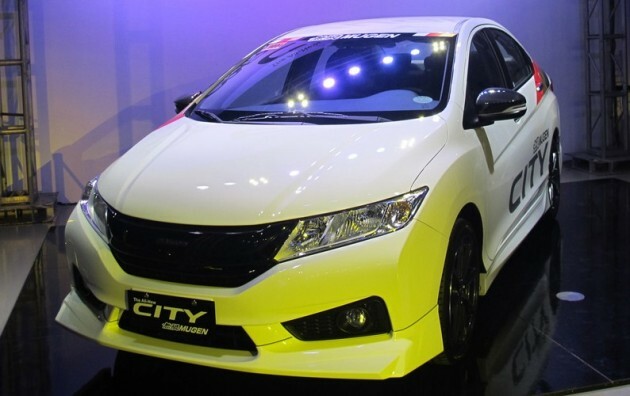 Yes folks, the Honda City Hybrid will be coming to Malaysia. This year, in fact, and as a CKD model too, as confirmed by Honda Malaysia CEO, Yoichiro Ueno. This is the first time, anywhere in the world, that a Honda official has specifically confirmed that such a model exists. Previously, the company had only hinted that a new hybrid B-segment sedan will be introduced in Japan, which everyone then deduced to be an electric motor-assisted version of the 2014 Honda City. No more conjecture needed, then. First details of the new model have been announced too. For starters, it’s now known that the City Hybrid will use Honda’s latest Sport Hybrid Intelligent Dual Clutch Drive (i-DCD) one-motor hybrid system that’s in the latest Jazz Hybrid, and not the older Integrated Motor Assist (IMA) system. As per the Jazz Hybrid it’s based on, it will also have a centre-mounted fuel tank, as opposed to the rear-mounted item in the standard petrol model. Furthermore, the hybrid system’s battery pack (likely to be of the lithium-ion variety) will be stored under the rear seats. That’s all the info we have for now. Stay tuned for more in the coming months.